Whatever you may think about fast food (and we at The Takeout love it), you can’t deny that fast food chains have conjured up some wildly creative—and often delicious—menu items for local markets around the world. (At McDonald’s world headquarters in Chicago, its restaurant even serves some of those global offerings.) I still hope KFC Japan’s corn soup nuggets will one day be a regular item outside of Japan, and I impatiently wait for McDonald’s Hong Kong’s seasonal taro pie every year. But no other fast food item has ruined me like the McSpicy Paneer, which features a thick slice of crispy, breaded paneer with just the right balance of resistance and give. It took two years for McDonald’s India to develop a paneer fillet that was firm enough to be deep fried, yet creamy enough to sink your teeth into. The results are so positive that even though McDonald’s India uses over 120 tons of paneer a month, the McSpicy Paneer regularly sold out after it was introduced in 2011. 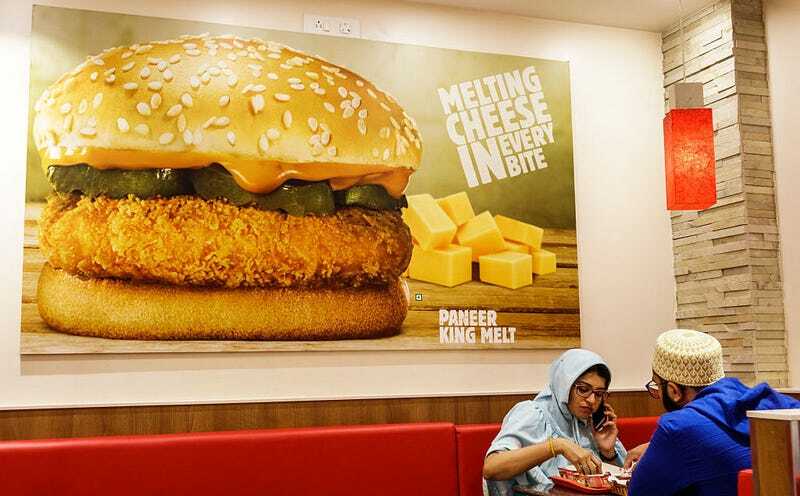 Since then, other fast food chains in India have added their own paneer items, such as Taco Bell’s potato paneer burrito and the Paneer King Melt at Burger King. While I think that these other contenders don’t have the charisma of McSpicy Paneer, as far as I’m concerned, there can never be too many paneer dishes. I’m not the only one who feels this way; this mild-tasting, fresh, unsalted cheese most commonly (and misleadingly) compared to cottage cheese is popular everywhere Indian food is enjoyed. Paneer (from the Persian word for cheese “panir”) doesn’t have a confirmed provenance, but it was likely developed in Punjab through contact with nomadic tribes from Central Asia. In Punjab, paneer is traditionally made with hot buffalo milk, using yogurt or buttermilk as a splitting agent. The arrival of the Portuguese in Bengal also brought the technique of curdling milk with acid, which led to the development of Bengali sweets like rasgulla made with channa, a type of fresh cheese similar to paneer. The influx of Punjabi refugees in India after Partition turned paneer from a regional specialty to a part of mainstream Indian cuisine. A lot of this popularity may be due to how easy it is to make the cheese at home. All you need to do is add an acid like lemon juice or plain live yogurt to boiling milk. After straining out the liquid from the curd with cheesecloth, you can help the paneer firm up by dipping it in ice water or refrigerating it. Grocers like Whole Foods often stock paneer if you don’t have the time to make your own. One thing to remember, though: Commercial paneer is often firmer and denser than homemade ones. If you’re in possession of rubbery paneer, you can soak it in hot water until it softens up. This technique also helps store-bought paneer absorb flavors more readily. Another reason for paneer’s widespread use is its versatility as an ingredient. Nandita Godbole, author of several Indian cookbooks, most recently Ten Thousand Tongues, explains that it’s a favorite ingredient not only because paneer’s neutral taste allows it to absorb other flavors, but also because it holds its shape even when cut into small pieces, and it won’t melt when cooked. That means that paneer adds texture and bite to liquid-heavy dishes, and Godbole suggests adding it to any cream- or tomato-based stew for lovely little bursts of milky-cheese flavor. You can also make smoky, grilled paneer by marinating it first in your favorite spices, basting lightly with oil, and then grilling for a few minutes. Or you can make a lazy-day dish by adding fried paneer and vegetables like peas and carrots to rice. Most people are used to paneer in savory dishes, but I have sat at the kids’ table during the entire length of a birthday party just so I could eat extra bowls of paneer kheer, a creamy saffron-infused pudding. It’s a dessert that’s pretty easy to make, and even easier to gobble down, so you may want to make more than you think you need. If paneer kheer is too time-consuming, Godbole has a great, simple dessert recipe: Mix soft, crumbled paneer with condensed milk to use as a filling for dessert crepes. If you’re wondering how you can get your mouth on the McSpicy Paneer, there are some DIY recipes online, with this particular one representing a pretty decent facsimile. It doesn’t taste exactly like the McSpicy Paneer—for the record, I didn’t think the biscuits from that viral DIY Popeye’s biscuit recipe tasted the same either so maybe I just have really high standards—and you’ll need to get your hands on peri-peri seasoning and Cornitos chips. Otherwise, get yourself to India to understand the cult of this crispy, squishy, mayo-slathered deliciousness. Or maybe head to Sweden, where Burger King’s Halloumi King sounds every bit as appealing. Those menu hits highlight a universal truth: Sandwiched fried cheese is awesome in any language.